Albert Einstein is often cited as one of the most influential scientists of the 20th century. His work helps astronomers study everything from gravitational waves to Mercury's orbit. His equation that helped explain special relativity – E = mc2 – is famous even among those who don't understand the underlying physics. He also is known for his work on general relativity and the photoelectric effect; his work on the latter earned him a Nobel Prize in 1921. Einstein also made vain attempts to unify all the forces of the universe in a single theory, which he was still working on at the time of his death. "I think he was recognized in his time as being pretty revolutionary," said Harry Cliff, an Einstein historian at London's Science Museum, in a February 2017 interview. "However, with big, new ideas, it takes them a while to become accepted and part of the mainstream." Einstein was born on March 14, 1879, in Ulm, Germany, a town that today has a population of just over 120,000 and has a small commemorative plaque where Einstein's house used to stand. (The house was destroyed during World War II.) The family moved to Munich shortly after his birth, then to Italy as his father faced problems with running his own business. His father, Hermann, ran an electrochemical factory and his mother, Pauline, took care of Albert and his younger sister, Maria. Einstein would write in his memoirs that two "wonders" deeply affected his early years, according to Hans-Josef Küpper, an Albert Einstein scholar. He encountered his first wonder — a compass — at age 5. He was mystified that invisible forces could deflect the needle. This would lead to a lifelong fascination with invisible forces. The second wonder came at age 12 when he discovered a book of geometry, which he devoured, calling it his "holy geometry book." Contrary to popular belief, young Albert was a good student. He excelled in physics and mathematics, but was a more "moderate" pupil in other subjects, Küpper wrote on his website. However, Einstein rebelled against the authoritarian attitude of some of his teachers and dropped out of school at 16. He later took an entrance exam for the Swiss Federal Polytechnic School in Zurich, and while his performances in physics and math were excellent, his marks in other areas were not sufficient, and he did not pass the exam. He took additional courses to close the gap in his knowledge, and was admitted to Swiss Polytechnic in 1896. In 1901, he received a diploma (to teach physics and mathematics). However, Einstein could not find a teaching position, and famously began work in a Bern patent office in 1901, according to his Nobel Prize biography. It was here, after analyzing patent applications, that he developed his work in special relativity and other parts of physics that made him famous. Einstein married Mileva Maric, a longtime love of his from Zurich, in 1903. Their children, Hans Albert and Eduard, were born in 1904 and 1910. (The fate of a child born to them in 1902 before their marriage, Lieserl, is unknown.) He divorced Maric in 1919 and subsequently married Elsa Löwenthal, a cousin on Einstein's father's and mother's sides. Löwenthal died in 1933. Albert Einstein in Princeton, USA. Einstein's career was peripatetic. He earned his doctorate in 1905, and subsequently took on professor positions in Zurich (1909), Prague (1911) and Zurich (1912). Next, he moved to Berlin to become director of the Kaiser Wilhelm Physical Institute and a professor at the University of Berlin (1914). He became a German citizen. "When that was published in the press, Einstein became this global celebrity," Cliff told Space.com. "Even today there aren't many scientists who are household names, like Stephen Hawking. Einstein was the first of those [modern] celebrities." Einstein remained in Germany until 1933, when dictator Adolf Hitler rose to power. 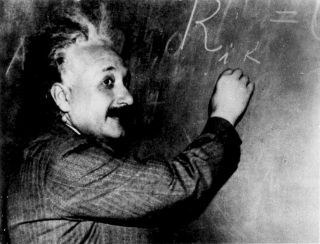 Einstein then renounced his German citizenship and moved to the United States to become a professor of theoretical physics at Princeton. He became a U.S. citizen in 1940 and retired in 1945. Einstein remained active in the physics community through his later years. In 1939, he famously penned a letter to President Franklin D. Roosevelt warning that uranium could be used for an atomic bomb. "It was one of the key triggers behind the Manhattan Project," Cliff said, referring to the successful effort the United States initiated to build nuclear weapons during WWII. "That letter persuaded the government to take it seriously. His voice was heard at the top of government." Late in Einstein's life, he engaged in a series of private debates with physicist Niels Bohr about the validity of quantum theory. Bohr's theories held the day, and Einstein later incorporated quantum theory in his own calculations. Einstein died of an aortic aneurysm on April 18, 1955. A blood vessel had burst near his heart, according to the American Museum of Natural History (AMNH). When asked if he wanted to have surgery, Einstein refused. "I want to go when I want to go," he said. "It is tasteless to prolong life artificially. I have done my share; it is time to go. I will do it elegantly." Einstein's body — most of it, anyway — was cremated and his ashes were spread in an undisclosed location, according to the AMNH. However, a doctor at Princeton Hospital, Thomas Harvey, had performed an autopsy, apparently without permission, and removed Einstein's brain and eyeballs, according to Matt Blitz, who wrote about Einstein's brain in a 2015 column for Today I Found Out. Harvey sliced hundreds of thin sections of brain tissue to place on microscope slides, and snapped 14 photos of the brain from several angles. Harvey moved to Wichita, Kansas, where he was a medical supervisor in a biological testing lab. Over the next 30 years, he sent a few slides to other researchers who wanted to study the brain, but kept the rest of the brain in two glass jars, sometimes in a cider box under a beer cooler. The story of Einstein's brain was largely forgotten until 1985 when a study was finally published. Harvey failed a competency exam in 1988, and his medical license was revoked, Blitz wrote. Harvey eventually donated the brain to Princeton Hospital, where the brain's journey had begun. Harvey died in 2007. Pieces of Einstein's brain are now on display at the Mutter Museum in Philadelphia. One of the first papers, titled "On the Brain of a Scientist: Albert Einstein" was published in 1985 in the journal Experimental Neurology. The researchers found that Einstein's brain had a greater number of glial cells (cells that support and insulate the nervous system) per neurons (nerve cells) than other brains they examined. They concluded that it might indicate the neurons had a higher "metabolic need" — that they needed and used more energy and that might explain why Einstein had better thinking abilities and conceptual skills. However, other researchers have pointed out a few problems with that study, according to Eric H. Chudler, a neuroscientist at the University of Washington. First, for example, the other brains used in the study were all younger than Einstein's brain. Second, the "experimental group" had only one subject — Einstein. Additional studies are needed to see if these anatomical differences are found in other people. And third, only a small part of Einstein's brain was studied. Another study, published in 1996 in the journal Neuroscience Letters, found that Einstein's brain weighed only 1,230 grams, less than the average adult male brain (about 1,400 g). Also, Einstein's cerebral cortex was thinner than that of five control brains, but the density of neurons was greater. A study published in 2012 in the journal Brain revealed that the Einstein's brain had extra folding in the gray matter, the site of conscious thinking. In particular, the frontal lobes, regions tied to abstract thought and planning, had unusually elaborate folding, analysis suggested. Theory of special relativity: Einstein showed that physical laws are identical for all observers, as long as they are not under acceleration. However, the speed of light in a vacuum is always the same, no matter at what speed the observer is travelling. This work led to his realization that space and time are linked into what we now call space-time. So, an event seen by one observer may be seen at a different time by another observer. Theory of general relativity: This was a reformulation of the law of gravity. In the 1600s, Newton formulated three laws of motion, among them outlining how gravity works between two bodies. The force between them depends on how massive each object is, and how far apart the objects are. Einstein determined that when thinking about space-time, a massive object is a distortion in space-time (like putting a heavy ball on a trampoline.) Gravity is exerted when other objects fall into the "well" created by the distortion in space-time, like a marble rolling towards the large ball. Photoelectric effect: Einstein's work in 1905 proposed that light should be thought of as a stream of particles (photons) instead of just a single wave, as was commonly thought by the time. His work helped explain some curious results scientists saw at the time. The photoelectric effect refers to how electrons are ejected from the surface of a metal due to incident light. The "wave" theory of light suggests that the electrons should be ejected with more energy when the incident light is increased, but experiments showed that the energies are actually independent of the radiation intensity. "It was a difficult idea to accept at the time," Cliff said. "It contradicted the 19th-century wave picture of light." Unified field theory: Einstein spent much of his later years trying to merge the fields of electromagnetism and gravity. He was unsuccessful, but Encyclopedia Britannica suggests that Einstein was ahead of his time because, for example, the strong force in quantum mechanics was better understood in the 1970s and 1980s. Other physicists are still working on this problem. Gravitational waves: In 2016, the Laser Interferometer Gravitational-Wave Observatory (LIGO) detected space-time ripples — otherwise known as gravitational waves — that occurred after black holes collided about 1.4 billion light-years from Earth. LIGO also made an initial detection of gravitational waves in 2015, a century after Einstein predicted these ripples existed. The waves are a facet of Einstein's theory of general relativity. Gravitational lensing: This is a phenomenon by which a massive object (like a galaxy cluster or a black hole) bends light around it. Astronomers looking at that region through a telescope can then see objects directly behind the massive object, due to the light being bent. A famous example of this is Einstein's Cross, a quasar in the constellation Pegasus. A galaxy roughly 400 million light-years away bends the light of the quasar so it appears four times around the galaxy. "Everything should be as simple as possible, but not simpler." "Human beings, vegetables, or cosmic dust, we all dance to a mysterious tune intoned in the distance by an invisible player." You can see more Einstein quotes here. Additional reporting by Reference Editor Tim Sharp.